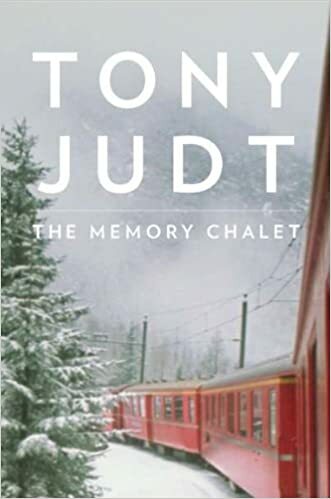 The Memory Chalet Tony Judt. William Heinemann, London. 2010. Rarely do such gems simply fall into your lap. Playful without being silly. The kind of book that leaves you smiling not merely at the end of each chapter, but often after a mere paragraph. Smiling because the words are so delightfully appropriate, so evocative , catapulting you not only into the author’s memories, but into your own. The details may differ, but the essence of memory lives, vivid, unforgotten and absolutely unforgettable. As the book jacket promises, Tony Judt’s The Memory Chalet (Penguin Press, 2010) is indeed a memoir unlike any you have ever read before. It is with some embarrassment that I acknowledge never having heard of this prolific writer who was nominated for the Pulitzer Prize and who has written or edited more books and articles than can be safely counted. Many of these are serious history books, and while, like me, you may wish to delve further, you need not read these to enjoy The Memory Chalet. It stands alone as a source of reading pleasure. Sentences that beg the reader to join the fun in the chapter to follow. Example: “Just because you grew up on bad food, it does not follow that you lack nostalgia for it.” Who can avoid being pitched into a world of childhood favourites frowned upon in our health-conscious present? Whether the topic is broad (What happened to French intellectuals?) or narrow (I love trains, and they have always loved me back), whether it reflects the public sphere (New York, New York) or the private (Go West, Young Judt), whether it reflects childhood (I hated school) or maturity (Other men change wives. Some change cars. Some change gender. The point of a midlife crisis is to…. ), it is always engaging and pleasurable to read. Judt has no axes to grind. There is something acute about his observations, yet they are never bitter, and the effect of his words is unfailingly uplifting. If ever again I am tempted to feel even remotely sorry for myself, I hope someone will retrieve The Memory Chalet from my bookshelf, and wordlessly place it in my lap. This entry was posted in Blog, What I'm Reading by Luke. Bookmark the permalink.